In 2005, the EAC bought a 90-year-old house on Fern Lane in Halifax’s North End. It was a typical North End Halifax “salt box”, rectangular in shape with a very slight slope in the roof. The building was approximately 3000 sq ft, almost double our previous space on Argyle Street in downtown Halifax. The following year, more than 150 volunteers have helped us transform our Halifax home into a 'green' office. This was the first of two major renovations we did with our building – click here to learn about our 2015 renovation! Read on to hear stories from our 2006 renovation and learn about the decisions we made along the way. The renovation was guided by Peter Henry Architects, the EAC Home Committee and Archnet Home Build and Renovate. The first floor had been renovated in the 1980’s while the second floor contained many original elements of the building, including trim, a cast iron bathtub and a slate fireplace. We completely altered the building layout, moved walls, stairways and added new windows. We focused on improving energy efficiency through insulation to prevent heat loss, installation of a solar in-floor radiant heating system, and an increase in day-lighting as well as installation of energy efficient lighting. We also installed a heat recovery ventilation system (HVAC) to ensure that heat is not lost as fresh air is brought into the building. We used local products, sustainable harvested wood, recycled and non-toxic products wherever possible. Many of our original choices such as straw board were ruled out because of availability and transportation costs. The bookcase pictured on the right was constructed entirely of Forest Stewardship Council-certified, sustainably grown wood from Windhorse Farm. The following principles were developed to guide decision-making in our own eco-renovation so that we could ensure that all decisions were consistent with our environmental and social values. We encourage you to consider this list as a start to setting out your own principles prior to starting your eco-renovation. How will we prioritize green material procurement and use? How will we determine supplying companies? As a general rule of thumb, EAC will avoid purchasing products from companies that our campaigns actively engage in. We will assess this on an ongoing basis, and anticipate that our procurement philosophy will generally limit any conflicts of this nature. We will also support companies within the community, that reduce our need to travel to obtain necessary building supplies. At what cost do we go out of the way to support locally produced materials? The overarching EAC mandate is to create sustainable jobs for Nova Scotians, we would go to lengths to support local if indeed it is the best choice, from a longevity and reusable point of view. Our office is wheelchair accessible by a ramp off our back entrance and deck. We prioritized the transformation of Fern Lane into an accessible work place, adhering to Barrier Free Design Guidelines during construction. Our first floor was made wheelchair accessible for a full range of office functions including the kitchen, copy room & mail room, two meeting rooms and all office spaces. High contrast wall and floor finishes were chosen for the visually impaired. Our back entrance is accessible from a ramp and deck, and we added an accessible washroom on the first floor. Our building had blown in insulation in its exterior walls, which was done in the 1980's. Despite this, results of a home energy audit, donated by the Clean Nova Scotia Foundation, showed that our building scored a 16 out of a possible 100 – with 0 being the outdoors, and 100 being a completely energy efficient, off grid building. New homes should be built to at least R2000 standards, with walls insulated to R-20 and roofs to R-40. The R –value relates to the thermal resistance of a material. During the renovation process, insulation choices were discussed extensively. The range of natural insulation products is great, but cost and local availability had to also be considered. We used a combination of materials, to achieve an R value of ~20 for all walls. We added to the existing cellulose by an additional 2 inches of Styrofoam rigid board to all exterior walls. The product we used was called TrueFoam and is manufactured in Burnside Industrial Park in Dartmouth. Unlike many rigid foam boards, TrueFoam does not use CFCs or HCFCs. In areas where we had to replace the cellulose, we used formaldeyhe free fibreglass bats. The roof had been un-insulated. We added blown in cellulose as well as TrueFoam for R-values that ranges from 39-57. Following insulation, all walls were sealed with a vapor barrier. A second energy audit showed that we had tripled our score to receive 48 points. We will continue insulating the basement to receive a final score upwards of 53 points. The best way to save energy on lighting is to design a building that makes the best use of daylight. We created ten interior windows on the east side of the building so that light could penetrate from the south and west sides into the interior of the offices. Unlike our previous office space, lights are rarely on during the day at Fern Lane. Overhead fluorescent lighting was added, and each desk or workspace was given a task light equipped with a 15 watt fluorescent bulb. We covered our in-floor, solar-powered radiant heating system with 2 inches of concrete intended to slowly radiate heat which keeps down the overall temperature in the building, and thereby conserves energy. The concrete flooring was treated with Kemiko Concrete Floor Stain, and then Rembrandt Wax to provide a durable, low-maintenance surface. The acid used to treat the flooring has a surprisingly low environmental impact; it can simply be neutralized with baking soda upon removal. 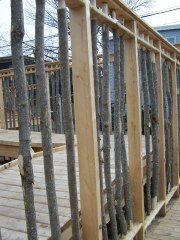 A garden was designed and installed by students under Kim Thompson's direction at Dalhousie's Faculty of Architecture. The intent of this garden was to be a demonstration for organic gardening and composting. Raised beds allow universal access to vegetable and flower gardens. These solar panels on our roof provide the energy needed to power our heating system. We added 2 rows of 6 solar panels to our roof. The panels are recycled, and were refitted by Thermo Dynamics Ltd in Dartmouth, NS, one of the world's leading developers of solar technology. The system was installed by Dr. Solar. These panels became the primary heat source through solar energy distributed through radiant in-floor heating. The panels use sunlight to heat water by heating a metal Sunstrip that in turn heats a glycol solution (a mixture of antifreeze and water) that is then pumped through a heat exchanger in the basement. The pump is run by a small photovoltaic panel. The heat is transferred to pipes filled with water, which is then heated and circulated throughout the building, warming the concrete floors. The floors act as a thermal mass, collecting and holding the heat. We also installed a small electric boiler to supplement the heating system. 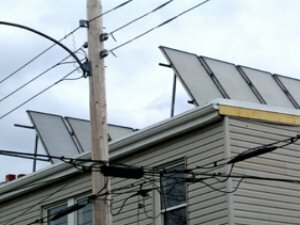 The split between solar and electric was expected to be 60/40 at the time of installation. Indoor plants help improve air quality. Throughout the renovation, we were very careful to avoid products and materials that are known to off gas and contain substances such as glue and formaldehyde. 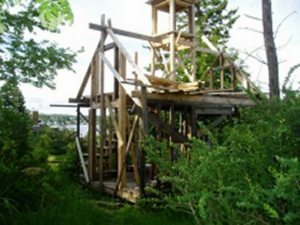 No OSB board was used, and instead we used sheathing donated by Veridity Products as it uses 95% less glue than conventional sheathing products. In the finishing stages, we used no MDF or particle board. We made a concerted effort to replace our old particle board desks with solid wood desks and no new desks or chairs, that tend to contain fire retardants, were purchased. No carpets were installed in the building and all old carpets were removed. Keeping staff and volunteers healthy is extremely important to us. Because of the scale of renovation, we were required by building code to install a ventilation system. The code now requires this because many air tight homes were being built with little opportunity for air exchange. These buildings often included materials that off-gassed and have resulted in human health concerns. A ventilation system ensures air exchange throughout our building. When it is too cold for the windows to be open and the ventilation system is in full force, an HVAC system efficiently transfers heat from the outgoing warm air to the incoming cool air. We have also placed many indoor plants throughout the space to improve air quality by absorbing air pollutants. Shed constructed by Syd Dumaresq using salvaged lumber from the EAC renovation. One of our guiding principles was to ensure that as little material as possible was taken to the landfill. With conventional renovation projects, up to 25%-50% of the original biomass of a building can end up in the landfill depending on the scale of renovation. In order to avoid this, EAC has worked hard to re-use and recycle as many materials as possible. We carefully sorted all of our construction waste. Much of the plaster from the original building was removed and 9.3 tonnes were taken to C&D Recycling. Old plaster is made from lime and horse hair, and is biodegradable. All wood that was not reused in the building was taken to a welding shop and used to heat the building over the winter. Lath removed from the plaster & lath walls was broken into small pieces and many, many people picked it up to use for kindling. Longer pieces were saved and continue to be used creatively to create pea trellises. All metal removed from the building, including t-bar from the dropped ceiling, and copper and lead pipe from the plumbing system, was recycled. Extra TrueFoam insulation was inserted into interior walls to provide additional insulation and soundproofing. Many items, such as reusable t-bar, acoustic panels, old wall panelling, reuseable cellulose insulation, fluorescent lighting, electric baseboards among other things were posted on HRM Freecycle and reused by freecycle members. EAC staff and volunteers used bike trailers such as this one to move furniture from our old location to the Fern Lane building. The Ecology Action Centre aims to be a model for other organizations by demonstrating sustainable workplace transportation infrastructure. When the building was first sold, neighbors were worried that a new business would mean more traffic and less available parking on the street. In our 2006 renovation, we did the opposite of the vast majority of commercial properties, by reducing the available parking spots from 4 to 1. This gave us more room for outdoor meeting space, compost demonstration, and urban food production. Bike racks were added to provide parking for up to 30 bicycles. A solar-powered, low-flow shower for those extra-long commutes was also installed. The natural plasters used on the building can be decorated with beach glass, as seen here. Kim Thompson created a variety of incredible natural wall finishes on walls throughout the building. These finishes were extremely cost-effective, chemical-free and brought a natural elegance to the building. Recipes for some of the finishes used are below. Most walls were painted a variety of natural colors to enhance light from the windows and create a refreshing atmosphere. Some of our wall paints were manufactured in Fredericton, New Brunswick by Eco-House, while others were a home-made clay variety. The difference from conventional paints was incredible. Even after two weeks of constant painting, there were no odors in the building. The paint is a mineral based paint that absorbs into new drywall, rather than coating the surface like latex or oil based paints. Wood was finished with zero VOC Harmony paint from Sherwin Williams and paint for the bathrooms was purchased from Boomerang, a company that sells reconstituted latex paints that are mould resistant. Boil 1 1/2 parts water. When boiling, add the above mixture of flour and cold water. Turn heat to low, continue to cook until the mixture thickens while continually stirring the bottom to prevent burning. Dilute every 1 part starch paste with 2 parts water to make paste liquid enough to add other ingredients. Add colored clay or white kaolin clay with pigments to achieve a consistency that will spread easily with a brush, looks like it will cover in two coats and is the consistency of thick cream. Mica can be added to simulate clays that have naturally occurring mica. Fine screened, chopped straw can also be added. If adding either or both, add less clay because the mica and straw will thicken the mix. Apply with a brush, and while the paint has set but is still moist, use a damp tile sponge to polish the surface, removing excess dust and revealing the straw and mica. A plastic lid with the edges cut off can also be used as a flexible scraper to further polish the surface. Recipe: Proportions may vary depending on the type of clay used, but the objective is to get enough clay mixed in with the sand or straw to prevent cracking due to excessive shrinking. The amount of clay needed can be gauged by checking if the mixture will stick to a metal trowel held perpendicularly to the ground. If it does stick, do not add any more sand or straw to the plaster or it will lose plasticity. Apply with a trowel evenly on the wall and screen the excess off. Fill in low plaster areas with additional mix and use a wood or foam float in a gentle, circular motion until the plaster begins to compact. Let the plaster rest and when some of the moisture has been absorbed, use the metal trowel again to smooth it out. Recipe: proportions vary depending on the type of clay. High clay soils will typically require additional sand, which can range from 0-1/2 part sand per part of clay. Proportions of straw will vary from 4-5 parts. Apply to a thickness of 1/2"- 1 1/2". When drier, it can be applied more thickly and used to fill out deeper areas. Precaution: Too much water will make the mix misleading in terms of binding quality. Letting the mix sit for a day or more will improve it. Mix the dry and wet ingredients to the consistency of a joint compound. Recipe: Mix the powdered hydrated lime with water, and stir well until it has the consistency of thick cream. Allow to sit for as long as possible, from several hours to days. Apply with a wide coarse brush by laying the paint on evenly without goingback over areas. Work vertically, let dry, and then work horizontally. If applied too thickly, it will peel or dust off. Leftover lime can be stored in plastic or glass containers for use at a later date. Waterless urinal by Green Pea. Our initial goal was to reduce our water use by 75% over conventional offices and particularly over our past office. We installed a six litre toilet downstairs (most toilets are 13L) and a dual flush (3L/6L) upstairs. 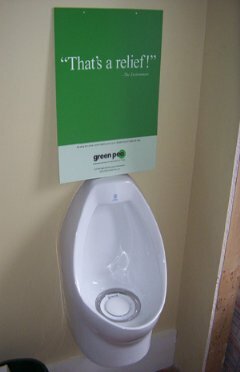 We also installed a waterless urinal which was sold locally by Green Pea. We added low flow taps in the bathroom, kitchen, and shower. One of the best ways to save water is to ensure that it is not wasted – that taps are not left running, toilet flushing is reduced and watering of plants is done by water collected off the roof instead of from the tap. The building is plumbed so that in the future we can easily install a cistern to store rainwater collected from the roof. This water can then be used in our garden or for flushing toilets. This will reduce the storm water run-off from the building, and ultimately be less of a burden on the planned sewage treatment plant. Our one parking spot is paved with Grass Crete – so that water can permeate back into the ground, instead of simply running into the street and down the storm drains. In order to do our bit to clean up Halifax Harbor, we discourage flushing of any plastic products, such as tampon applicators. We use only biodegradable cleaners and properly dispose of paints and solvents. Our water conservation strategy is a phased approach. Curious about water conservation in your own home? Please click here for an interactive assessment of the money and water you could be saving. On May 1, 2006 we settled into our very own, eco-renovated home at 2705 Fern Lane. It became a working demonstration of a green renovation, and we began to give tours of the building to the general public. Almost a decade later, we outgrew our home. The number of staff, volunteers and members at EAC more than doubled, and our need for more space became urgent! Read about our second renovation, which added a third storey to our building and further improved our energy efficiency here. We love taking individuals and groups on tours of our office. We welcome visitors during our office hours, and can offer tours of the space to individuals or groups looking to learn more about green buildings. VIRTUAL TOUR – Check out some of the interesting features of our current building on a digital walk-through. STAGE 2 RENOVATION – Hear stories from our 2015 renovation and learn about the decisions we made along the way. Rod Malay is a construction manager who specializes in environmental construction. Nova Scotia residents planning the construction of a new house are eligible for an evaluation of energy and heating efficiency of their new homes for $350 so that future costs and the feasibility of alternative solutions can be assessed. Successful completion of the program refunds half of this deposit, and an energy rating of 77/100 or better fully refunds the deposit and a 10% reduction on CMCH Mortgage Loan Insurance. LEED (Leadership in Energy and Environmental Design) Certification is granted in Canada by the Green Building Council based on adherence to the following five principles: Sustainable Sites, Water Efficiency, Energy and Atmosphere, Materials and Resources, Indoor Environmental Quality. Version 1.0 of LEED Canada-NC for New Construction and Major Renovations was used throughout the project for suggestions on how to improve the environmental efficiency of all aspects of project design and construction. Wilson, Alex and Mark Piepkorn. Green Building Products: The GreenSpec Guide to Residential Building Materials. Gabriola Island: New Society Publishers, 2005. This book is an invaluable resource for locating manufacturers for all aspects of green building through a clear and accessible layout.